Sacramento Companies Can Create Jobs if We Can Get Fannie and Freddie out of our way! Sacramento, California Business News – Fannie May and Freddie Mac are against the idea of PACE Property Assessed Clean Energy which is a new financing method that allows homeowners to pay for home improvements, like solar and window replacement, through a special property-tax assessment facilitated by California Cities like Sacramento. Both companies, Fannie and Freddie, have acted with the blessing of the Federal Housing Finance Agency, and they’ll no longer issue mortgages on properties that have PACE financing. What this really means is big companies are against this because it they loose a little more of their choke hold on the American people. Balderdash! Fanny and Freddie were certainly warm to the idea of American taxpayers bailing their administrative bureaucrats out while they collected their million dollar salaries as they drove their businesses into a ditch. President Obama should put Edward J. DeMarco, the acting director of the Federal Housing Finance Agency, on the sidewalk with his bags. Congress needs to step in and get Fanny and Freddie out of the way of America creating good local jobs. This program is smart for Sacramento and all of California, it helps solar and renewable installation companies create local good paying jobs. PACE helps California and the USA become less dependent on disasters like what we are witnessing in the gulf and Fannie and Freddie need to get out of the way! The home load giants are afraid that if the homeowner defaults on the loan they guarantee they would be stuck with the improvement. I fail to see how that is a negative? All things being equal, the home with solar would resell faster that the one without. Whats the problem? Where are NBC, CBS, CNN and ABC news and why aren’t they all over this story? Maybe if more of us raise our voices in Sacramento we might just be heard! Don’t worry Sacramento, Jerry Brown is coming to the rescue. If he has the guts to do this for the California people, lets take a hard look at putting him back into the Governors seat this fall. 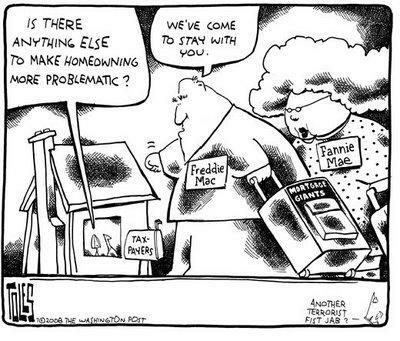 PACE is facing a serious threat from Fannie, Freddie & the FHFA. Help us urge Congress to protect these local green retrofit programs like the one in Sacramento. YOU CAN HELP! Click Here to go to Vote Solar and you will find a link to the California Congressmen in your district where you can notify them of the urgent need to get on this! Raise your voice now. Write then and let them know we want local jobs and energy independence. California Attorney General Jerry Brown filed suit Wednesday against Fannie May and Freddie Mac, claiming the mortgage giants have thwarted a home solar energy improvement program that would have arrived in Sacramento this fall. The suit argues that opposition to the program by the mortgage companies, and a decision last week to not participate in it, has forced counties like Sacramento to suspend plans to finance home efficiency upgrades, like solar panels and window insulation. That position, said Brown at a news conference in San Diego, undermines California’s efforts to boost energy savings and create green installation jobs. Brown’s suit was filed in a federal court in Oakland. The program at issue, formally called Property Assessed Clean Energy or PACE, is a novel financing method that allows homeowners to pay for home improvements through a special property-tax assessment facilitated by the county. Fannie May and Freddie Mac are cold to the idea because they fear homeowners who default on their mortgage would be obligated to pay the new tax assessment before making good on their home loan. The companies, with the blessing of the Federal Housing Finance Agency, say they’ll no longer issue mortgages on properties that have PACE financing. The two companies together own or guarantee about half the nation’s mortgages. Fannie May and Freddie Mac declined to comment Wednesday. But Edward J. DeMarco, acting director of the Federal Housing Finance Agency, said California’s energy program could put homeowners on shaky financial ground and increase the liability for the mortgage companies. He vowed to fight Brown’s suit. “Mortgage holders should not be forced to absorb new credit risks after they have already purchased or guaranteed a mortgage,” DeMarco told The Associated Press. The Federal Housing Finance Agency is also named in Brown’s suit, which seeks to have the feds lift their directive to shun properties with PACE financing. The city of Sacramento is one of 14 in CaliforniaFIRST, which would have been among country’s largest renewable financing programs. Although the position of Fannie May and Freddie Mac is likely to delay CaliforniaFIRST’s planned launch this fall, coordinators say they’re committed to making sure the program moves forward. “There are still other financing mechanisms,” said Margart Bruce, vice-president of Ecology Action’s climate group. “It’s analogous to if your car breaks down, there are other ways to get to work.” Bruce said while the preferred financing option remains the tax assessment, and she hopes Brown’s lawsuit or possible Congressional action will force Fannie May and Freddie Mac to honor it, financing could also be offered through more traditional loans. Other loans, though, don’t have the ease and security that come with a property tax assessment, a debt that is passed on to the next homeowner should the property sell. Supporters of the tax assessment, like Brown and Bruce, say the model comes with little risk to Fannie May or Freddie Mac. CaliforniaFIRST got $16.5 million of federal stimulus funds earlier this year to get off the ground. The program had planned for financing of up to $35,000 for homeowners and $75,000 for businesses, with interest rates around 7 or 8 percent over a 20-year term. “We’re going to start pulling out all the stops (to make sure this succeeds),” said Bruce. Blog editors note: You can get involved and put Sacramento back to work by to work installing solar and other home improvement projects. Get involved. Raise your voice and lets create independent sustainable energy and local jobs.